What Makes a Good SharePoint Consulting Firm? [description] => Systems Integration best practices and ideas for the best results. [category_description] => Systems Integration best practices and ideas for the best results. Real Estate Executives focus on replacing outdated systems and the need for cloud and mobile solutions. Positive year-over-year growth is almost any businesses primary objective. In the commercial real estate or CRE area, there seems to be an accelerating disruption curve caused by “rapid changes in tenant dynamics, customer demographic shifts, and ever-increasing needs for better and faster data access”. This disruption influences how these companies work and affect their ability to achieve maximum and revenue. It’s a good time to be a real estate developer. The United States continues to be the most favored destination for real estate investments, according to the Association of Foreign Investors in Real Estate (AFIRE). In their annual survey, foreign investors placed the United States as the top destination to invest in real estate. According to the AFIRE’s press release, 95% of respondents to the survey say they will maintain or increase their investment in the United States. Dallas—where HingePoint is headquartered—ranks 12th in the world for places to invest in real estate. Almost half of the top cities to invest in are within the United States. 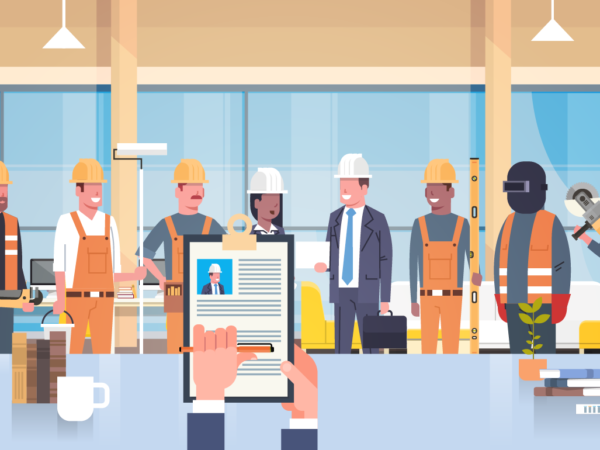 With increased investment in the United States, real estate developers will need to keep top talent and get them up to speed faster when they hire new employees. Onboarding can be frustrating at a company that does not have a process in place or a one-stop shop for internal employees and contractors. They’ll need to onboard new talent more efficiently and give instant access to needed information so employees can do their job better and come up to speed faster. Many developers and construction companies expected to grow are upgrading their internal SharePoint sites so employees can instantly access what they need to be more productively. Deloitte seems to think that competition for talent is going to be fierce. Cloud computing is Internet-based computing, where you can access shared resources, data and information on-demand. This information is stored on a computer or server that you can access through the Internet. Accessing the cloud with a mobile device gives you access to your entire business on the go. You can communicate and share virtually any document with anyone anywhere. Taking control of company information is one of the most difficult and one of the most critical tasks any company can take on. And believe it or not, SharePoint is still one of the top enterprise tools out there for collaboration, and sharing and organizing information. Anyone can start using the cloud and mobile devices. Any company can stand up SharePoint and make it a company initiative for all employees to use it. But if the information is not organized and found easily, and you can’t maximize the out-of-the-box solutions or customize SharePoint to work the way you want it, your enterprise style tools probably won't be effective. Bryce Finnerty, CEO and Founder of HingePoint, said more commercial real estate developers are completely changing their systems. “Many developers are going straight to customization. They want their systems and software to work the way they want it,” he said. Many commercial real estate developers are still using systems created in the first decade of this century, and some are still just relying on 2D CAD, email and paper. With mobile, the cloud and Autodesk’s newer capabilities, commercial real estate developers are seeing that they can leapfrog in productivity. Many developers will begin to completely overhaul their legacy systems and software. They will take an integrated approach, which means software will automatically share data and information with other software. For example, many developers want SalesForce and SharePoint to share information and data with each other. It streamlines effort of employees and makes collaboration better. Manual data entry and redundant tasks will dramatically fall. More employees will have access to critical information they need to do their job effectively. New technology allows Commercial Real Estate to build prototypes with photorealistic renderings and validate design selections. This helps developers sell properties with renovations first, gets approvals faster, and markets buildings faster for less upfront cost. 3D Virtual Prototypes speed up the design and construction phases on projects. Clients often gain 20% on their project timelines. Improved collaboration, decision-making, visualization, and clash detection are benefits proven to reduce costly change orders, delays, and rework. Augmented and virtual reality are so new for commercial real estate, some headsets are still being tested. For example augmented reality headsets like DAQRI’s Smart Helmet could revolutionize how new developments are built and how construction companies troubleshoot problems. They are also altering how real estate developers show off new properties. Instead of photorealistic prototypes on a computer screen, marketers can send headsets to prospects to let them literally walk around a multi-million dollar condominium or office. It makes data truly 3D. [post_content] => Microsoft SharePoint is one of the best tools to manage company data. However, finding an expert SharePoint consultant can be a difficult and time-consuming task. Here are a few things to look for when searching for a qualified SharePoint consulting and development partner. Has both consulting and development experience in your industry. Can customize the out-of-the-box capabilities of SharePoint. Understands how to organize data. You don’t want a company with little experience in your industry. If the consultant cannot prove their track record of satisfied customers, then you might need to look elsewhere. Always ask, what brands the SharePoint Consultant has worked with. Depending on what kind of solution you want, you may want to find a SharePoint consultant that has worked with trusted brands. For example, HingePoint has worked with brands like Marriott, Verizon, Presidio, and IHG. Make sure that they have experience working in your industry (or a similar industry). To meet your business' specific needs, SharePoint consultants sometimes only need to use the standard "out-of-the-box" (built-in) capabilities that come with SharePoint. But sometimes, they need to be able to customize SharePoint so it works the way you want. If you're looking for customization and the consultant can only perform basic configuration without any customization, you're going to be unsatisfied. The flip side is also true: if a SharePoint consultant only tries to push customization when you just need something basic, they aren't the right fit. Always ask, "Do you just configure out-of-the-box or do you customize SharePoint?" Let’s face it, if you're using SharePoint, you most likely want to manage all the information in your company. SharePoint is a great document management system. Without it, your documents are probably unorganized and difficult to find. If the SharePoint consultant does not know how to make a hierarchy of data, you might not have the right fit. Always ask,"Are you going to help me organize my data? Manage it on an ongoing basis?" Hiring a SharePoint consulting firm can be an investment that provides a positive ROI almost immediately. If you're in the process of finding the right consultant, we'd love to hear what you're looking to accomplish! Feel free to start a live chat with our solution consultant on this page, email us, or call us at (214) 301-0000 to get started today. [post_title] => What Makes a Good SharePoint Consulting Firm? What is Microsoft Power BI? In the past, you may have spent hours in Excel manually organizing data, creating pivot tables, charts, graphs, etc. in order to gain the insight needed to make critical business decisions. Power BI solves this headache by automatically connecting data from different sources into one central system — allowing you to organize data, build visually stunning reports, and personalized dashboards that help you find answers to your companies most important questions. Power BI brings all your data together – from all your data sources – so you can start analyzing and visualizing right away. For example, you can pull in data from Excel spreadsheets, on-premise data sources, and SQL databases. You can also automatically grab data from your favorite cloud services like Microsoft Dynamics, Salesforce, Google Analytics, Zendesk, Facebook, and more. Microsoft is continually rolling out direct integrations with other popular cloud services to make it even easier to get all your data straight into Power BI. Once you have the data you need, it should then provide you with the information required to make smarter and faster business decisions. That's where Power BI Q&A comes in. For example, want to know this year's sales compared to last years sales by month? No problem! Power BI Tools Keep You Focused on The Important Metrics. Gathering insights from your data is a breeze with Power BI’s simple drag-and-drop user experience. You can quickly find the insights you are looking for and visualize them in beautiful, interactive reports. Once you have a report, save it to your personal dashboard. Here, you can quickly see the charts and graphs with the data and metrics that are most important to you and your business. As we previously mentioned, you can also embed reports in SharePoint Online so that everyone (with access and the correct permissions) can view the report. Power BI Gives You The Insight to Stay on Top of Opportunities and Risks. Capitalizing on opportunities and minimizing risks are important to sustain business growth (of course). Power BI offers predictive forecasting to help you visualize future business performance (such as potential and predicted sales and risks) while providing more efficient data-driven decision-making opportunities. With Power BI consulting and development services from HingePoint, you can take the blindfold off, and see your data organized visually on one screen (instead of scattered across spreadsheets, software, and organizations). Interested in seeing how Microsoft Power BI can help your business? We'd love to have a conversation about what you are working on. Start a chat with our Solutions Architect on this page, give us a call at (214) 301-0000, or contact us here. With a few simple configurations, SharePoint can be the foundation for a flexible, user-friendly, and affordable Project Management Information System (PMIS). If you are not currently using Microsoft SharePoint and Office 365 to manage your commercial real estate projects… you should be! First, let’s clarify what Office 365 is. Some people think of Office 365 as Word, Excel, and PowerPoint for document creation and Outlook for email. Most are unaware that those are only a tiny piece of everything Office 365 has to offer. We will discuss what these apps are and how to leverage them to their fullest capabilities at a later date (stay tuned to our blog). In the meantime, you can check out the Top 5 Integration Features of Office 365 and SharePoint Online. Microsoft states that they have over 250,000 organizations using SharePoint and that over 85% of Fortune 500 companies now have SharePoint Online. You are already saving money on licensing costs by owning the SharePoint application through your Office 365 licenses. Using groups to maintain a scalable security environment is typically your best option because permissions are applied to the group as a whole, not individual people. So, when adjusting permissions, only one change is needed to a group (as opposed to multiple changes for different individuals). You can define a security permission from a site collection, to a site, to the lowest component of a single item or document. It's very easy to assign these permissions directly to an individual user or a group of users. The ability to leverage Office 365 Groups, which deliver a means of group communication, is a solid alternative to Slack and other popular messaging applications. Using Groups gives your team the ability to view, edit, share all group files, view, and schedule group meetings with ease allowing for better communications among team members. Granting external access in SharePoint Online is a breeze and no longer a time-consuming inconvenience. Simply connect a Microsoft account to their company e-mail or create guest links to give users access to folders, individual files, and sites within your environment. Microsoft Flow puts real power in the hands of regular users by easily connecting and automating services vital to your business. Microsoft Flow features code-free interaction with hundreds of third-party services such as Salesforce, Zendesk, Facebook, Twitter, OneDrive, Microsoft Dynamics, and more. SharePoint features powerful reporting tools to quickly view and share data. You can build, configure, and update scorecards and dashboards. Embedding Power BI reports to a SharePoint page (display charts, dashboards, reports, KPIs, etc.) on your SharePoint site makes the information readily available to users. Additionally, the analysis/metrics tools are now available within the program instead of having to import them; so, significant time is saved on importing data from other sources. You can also use Excel to build your reports and display them within SharePoint. Access to everything, from anywhere, and on any device. This is HUGE for the real estate and construction industry! View and work on documents while on the job site or in the field. With SharePoint Online, you have all the information you need on every device so you can get more work done with ease. SharePoint allows you to manage a set of tasks that may belong to a project, a business initiative, or a department. Users can also create customized list views, combined with out-of-the-box workflows to manage personal tasks and assign tasks to their team members or anyone else in the company. SharePoint is designed to be configured however you want and to provide the most value when managing commercial real estate projects. It can be very intimidating to try and figure out where to start with SharePoint because (by default), SharePoint is installed as a blank site without any content. At HingePoint, we have guru developers and architects that have ALL the Microsoft certifications. We can help you create customized SharePoint Online, Web Parts, .Net, and Office 365 APIs that are integrated with Microsoft Exchange, Active Directory (AD), and SQL Servers. If you properly implement SharePoint, it will transform your company’s productivity. Employees will be more efficient, you’ll have better access to your company’s data, and you’ll be able to better report on key metrics. HingePoint’s custom SharePoint solutions have helped many companies struggling with unorganized data and manual, multi-step processes. Those same customers have transitioned into a more organized, productive organization through automated workflows and easy-to-find information. Interested? We'd love to have a conversation about what you're working on. Start a chat with our Solutions Architect on this page, give us a call at (214) 301-0000, or contact us here.